Nonresidents, individuals who were in Taiwan for less than 183 days during a calendar year, are taxed on their Taiwanese-sourced income. Married couples are generally taxed jointly but a couple can opt for separate taxation. A taxpayer, his spouse and dependents are generally considered as a single tax unit and their incomes are generally consolidated on a single tax return. Income earned by nonresidents is generally taxed at a flat rate of 20%, withheld at source. No exemptions and deductions are allowable. Some specific types of income may be subject to different tax rates. Employment income (wages and salaries) are subject to 18% withholding tax rate. Investment income (dividends, commissions, rental income, royalties, professional fees) are subject to 20% withholding tax rate. Gross rental income earned by nonresidents is taxed at a flat rate of 20%. Rental income is also liable for either Value Added Tax (VAT) or Business Turnover Tax. Value Added Tax (VAT) is 5% of gross rental income. Business Turnover Tax of 1% may be charged for small scale enterprises in lieu of VAT if rent is paid directly to an individual, not a company. Capital gains on sale of properties are subject to income tax at progressive rates. The taxable gain is the difference between the selling price and the property cost (acquisition costs, improvement costs, transfer costs). Gains for the sale of land are exempt from income tax but are taxed under the Land Value Increment Tax (LVIT). Gains for the sale of land are exempt from income tax but are taxed under the Land Value Increment Tax (LVIT). Tax is computed based on incremental increase in assessed value of the land from the last transfer. Tax rate varies from 20% to 40%. Once Land Value Increment Tax is paid, capital gain will not be subject to income tax again. Loss from sale of land cannot be reserved nor utilized to offset against Land Value Increment Tax on other properties. For owner-occupied residential land, this tax is levied at a flat rate of 10% under certain conditions. Building tax is levied on all buildings in Taiwan at varying rates, from 1.2% to 5%, depending on the building classification. Residential properties are taxed annually at a rate of 1.2% to 2% of its current assessed value. The tax rate is determined by the county (province) or city government as approved by the local people´s assembly. This tax is levied annually for holding land in Taiwan. Tax is assessed by the government taking into account total value of land owned by a person or an entity in a district. Land for residential use is taxed at a flat rate of 0.2%, if certain prescribed conditions can be met. Land used for other purposes is taxed at progressive rates, ranging from 1% to 5.5%. Income and capital gains earned by companies exceeding 120,000 (US$4,000 are taxed at a flat rate of 20%. Income-generating expenses are deductible when calculating taxable income. 20%withholding is for non ROC residents who have staying in country less than 185days. if you stay longer you can get a lot of that refunded, depending on your tax bracket. the next year if you stay on the same ARC, resident visa, they should with hold a more reasonable amount, depending on your salary. 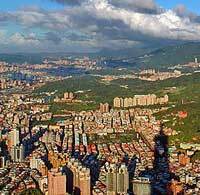 In Taiwan, most of the property owners do not pay rental income tax honestly because there are numerous ways to evade it, such as paying rent through cash instead of remittance, which is more likely to be detected by the IRS. Afterward, they declare a much lower amount of rent received (or not even declare) to the IRS. also, don't neglet the fact that almost all of the "current assessed value" of real estates in Taiwan are far undervalued (compared to the real market value), which means real property tax rate could be much lower than imagined.